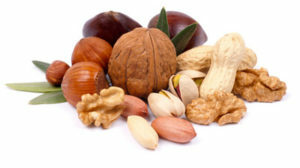 Looking for general information about nut varieties and nutrition? We’ve got you covered! Industry research shows that nuts are trending on today’s menus. Take a look at some of the exciting growth opportunities we’re seeing, as well as stats on unique flavors. Ready to add chipotle, sriracha and other on-trend flavored nuts to your menu? Visit our Chef Xpress page, featuring a wide range of sweet and savory coated nuts in whole, halved and slivered formats. Azar nuts add value to menu items across commercial and non-commercial channels of the foodservice industry. Take a look at the business-building tips and data most relevant to your operational needs. Maximize the profitability of your menu offerings with Azar nuts. They add eye appeal, exciting texture and patron-pleasing flavor to salads, entrées, side dishes, desserts and more. Cost-effective and convenient, nuts can truly transform a dish into a signature item. The “mass customization” trend is here to stay, and consumers expect a personalized dining experience (The Atlantic, May 2016). Address this demand by offering unique nuts or seeds as toppings. 58% of consumers say it’s important to eat healthy and pay attention to nutrition (Technomic, The Healthy Eating Consumer Trend Report, 2014). Nuts deliver big flavor and nutritional benefits to your menu. Consumers most prefer flavors described as sweet, savory, spicy and smoky (Prepared Foods, February 2016). Glazed, candied and coated Azar nuts add appealing flavor to a wide variety of menu items. Nothing beats a salty, crunchy snack paired with a cold beverage. And Azar has just the thing for satisfying hungry bar patrons. Try one of our pre-made snack mixes or create your own with a variety of roasted, coated nuts and seeds. 64% of chefs say “grazing” or snacking is a hot trend (National Restaurant Association, What’s Hot Culinary Forecast, 2016). Our culinary experts bring flavor trends to life—we can develop custom solutions to meet your bar menu needs. 50% of operators believe that the “upscale bar bites” movement is a trend with longevity (Datassential, TIPS, Winter 2015). Chef Xpress is known for quality and on-trend flavor, including coated nuts that add premium appeal. 49% of consumers are likely to try upscale bar bites (Datassential, TIPS, Winter 2015). Boost check averages with a selection of dishes and snacks featuring Azar products. Satisfy student “foodies” and picky eaters alike with delicious snacks, nuts and peanut butter from Azar. Our school line meets bread, protein and fruit nutritional requirements while delivering great taste. More schools are feeding students beyond classroom hours, including after-school meals and snacks (Foodservice Director, K-12 Census, March 2016). Offer nutritious options such as our portion-controlled Power Snacks. 78% of K-12 operators are concerned with students throwing away food that they’re required to take. (Datassential, Foodbytes: Kids’ Menu Keynote Report, 2016). Azar nuts and snacks are ideal for school foodservice, with kid-friendly flavors and fun packaging that students will love. Only 27% of parents believe school cafeteria meals are nutritious (Datassential, Foodbytes: Kids’ Menu Keynote Report, 2016). Effect change by offering cost-effective, flavorful and healthy nuts and snacks. Build profit at every level of hotel operations—including lounges, preferred-guest programs, poolside bars and restaurants—with Azar products. 55% of consumers consider food, drink and dining options when choosing a hotel (Datassential, Creative Concepts: Hotels & Lodging, 2016). Quality products from Azar add signature flair to meal and snack offerings in your establishment. 77% of consumers want healthy cuisine to be offered at hotels (Datassential, Creative Concepts: Hotels & Lodging, 2016). Nuts and seeds enhance menu items with appealing flavor and nutritional benefits. 76% of hotel guests want grab-and-go food options (Datassential, Creative Concepts: Hotels & Lodging, 2016). Azar nuts can be mixed and matched to create delicious snack blends, perfect for busy guests on the go. As healthcare foodservice diversifies to include patient meals, cafeteria dining and event catering, it’s essential to elevate quality. Azar products can bring about healthy returns with cost-effective, food-safe and convenient products. 62% of consumers love the idea of hospitals upgrading their foodservice options (Datassential, Creative Concepts: Hospitals, 2016). Our Chef Xpress line of on-trend products can help elevate recipes to restaurant-level quality and excitement. 84% of consumers consider healthier food options an important factor when selecting a hospital (Datassential, Creative Concepts: Hospitals, 2016). Nuts and seeds are high in protein, low in saturated fat and provide a wide range of essential nutrients. 87% of hospital dining/cafeteria patrons express interest in trying food from a salad bar (Datassential, Creative Concepts: Hospitals, 2016). Add flavor and texture to the salad bar in a healthful way with Azar nuts.